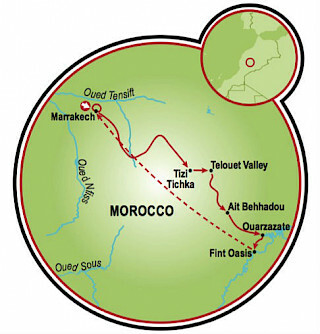 Bike in Morocco and tour Africa like never before! Bike in Morocco, the quintessential land of contrasts, both geographically and culturally. 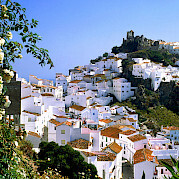 It is a nation blessed with stunning coastlines, high alpine meadows, exotic towns, and golden Saharan landscapes. 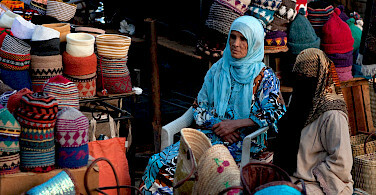 Considered a peaceful, tolerant society, Morocco is a tourist friendly destination and has been for 40 years. 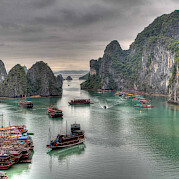 From adventurous and exotic to cosmopolitan and chic, it rises to meet all tastes and interests! This Morocco bike tour aims to capture Morocco's highlights which blend diverse natural landscapes with urban treasures, delicious gastronomy, and exotic local customs. It offers fabulous riding experiences in Morocco's most attractive zones including the surroundings of Marrakech, the foothills of the Atlas, the rural villages of the countryside, and into the Sahara Desert itself along gravel and tarmac roads. Each riding day offers completely different scenery and integrates as much of the culture and scenery as possible. Your guide will offer free interpretive walks and visits to monuments and/or historic or cultural attractions both during the day and in the evenings. This Morocco bike tour begins and ends in Marrakech, making international air travel very affordable. Daily rides may require some transfers, which are included in the tour package, to bypass areas of high traffic volume or difficult terrain. Transfer included from the airport to the starting hotel in Marrakech. Please check local conditions before your arrival. Average high/low temperatures in degrees Faharenheit for the region during the time of travel are: March 72°/52°, April 74°/53°, and November 72°/52°. 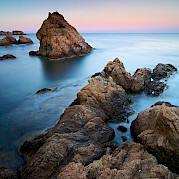 Morocco offers the best blend of weather and dryness for cycling tours. Please keep in mind that although the tour is considered guided, the tour guide does NOT cycle with the group unless there are more than 14 people. In that case, there is a tour guide and a support vehicle driver. Groups range from a minimum participation requirement of 4 to a max of 16 persons. For groups of less than 14 persons, the tour guide acts as the support vehicle driver. He/she ensures that hotel, meals, transport and the riding goes smoothly and acts as your evening host and guide. This person also deals with the general well being of our guests, looks after bicycle maintenance and keeps a close watch on road conditions, route changes, etc. 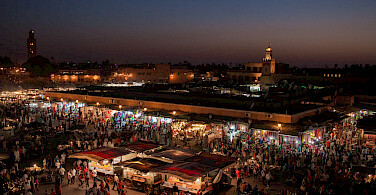 In the towns, all accommodations are comfortable, tourist class-Riad style hotels. In the countryside, hotels are cozy, rural hotels. Some hotels have pools and gardens and and some are within walking distance of the markets. Please note: This tour requires a minimum of 4 participants. This Morocco bike tour is designed for the casual rider over mixed terrain which consists of rural and paved roads as well as some good gravel paths. Average daily distance is 31 mi/50 km. Upon your arrival at the Marrakech Airport, you will meet your tour guide and after a 20-minute transfer to the hotel in central Marrakech there will be a quick orientation with the guide to discuss the weekly itinerary. 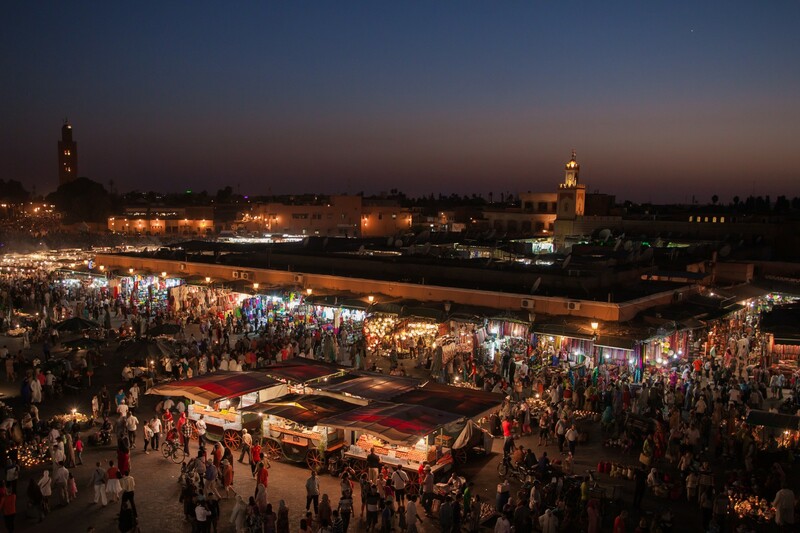 Accommodations for the evening are in a comfortable Riad (Moroccan courtyard style home), tourist class hotel located right in the center of the market and just outside the famous Jeml Ef Na square where snake charmers and fortune tellers are just part of this wild experience. A welcome dinner is included. 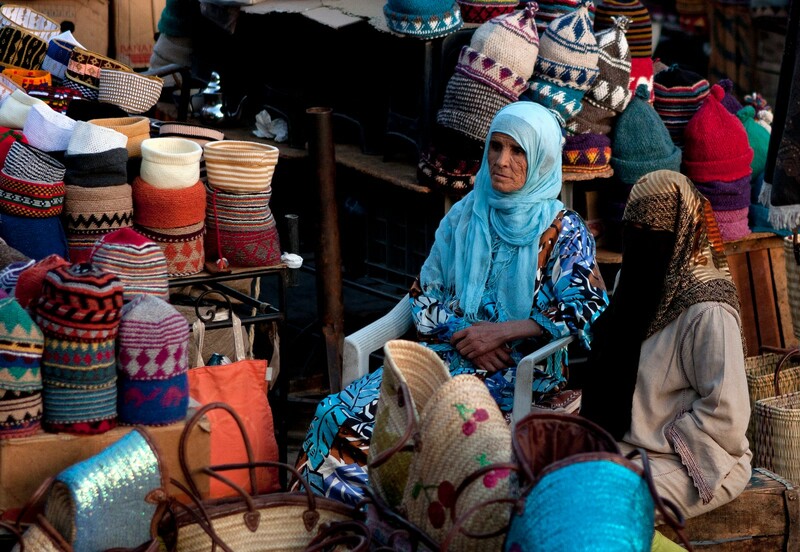 Your Morocco bike tour begins with in the old town of Marrakech. After lunch and a bike fitting, you will cycle through Marrakech’s oasis like Palmary (date palms), and flat surrounding countryside. Today’s round trip finishes back at the hotel in Marrakech. Today you will leave Marrakech and head for the Ourika Valley, an ancient Berber agricultural settlement rich in history and colorful tribal customs. It is a wonderful cross-country ride that passes through the foothills of the towering Atlas range. 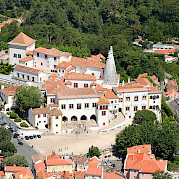 You will also ride through a lush river valley lined with villages built from stone and clay. This ride is generally flat with undulations and mild climbs in the foothills area. Accommodations for the evening are in a comfortable rural, tourist class hotel. In the morning, a private mini bus will shuttle you up the high Atlas Mountain pass to Tizi Tichka (2260 meters). From here you will mount your bike and descend into the stunning valley of Telouet where you will visit the famous Kasbah. 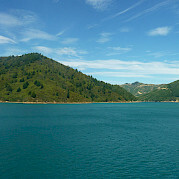 It is a spectacular day riding through charming hamlets and mountain landscapes. Tonight you will stay at a cozy guesthouse located in the Telouet region near the river. Today’s bike tour in Morocco is really remarkable as you begin the descent the Valley of Ounila, a timeless place with simplistic agrarian villages amid green oasis plantations and surrounded by desert canyon walls. This is your entrance to the Sahara Desert. You will have the opportunity to visit the well-known Kasbah and the film location of Ait Benhadou, which is the famous backdrop for features such as Lawrence of Arabia, Ben Hur, Gladiator, Indiana Jones and many more. Tonight you will stay in a comfortable, tourist class hotel with a swimming pool that is located right in the market place. Today’s ride takes you on well-maintained gravel paths over a range of easy routes across the Sahara Hamada, or stone desert plains. The plains are a sight to see with striking variations of rock formation and color. 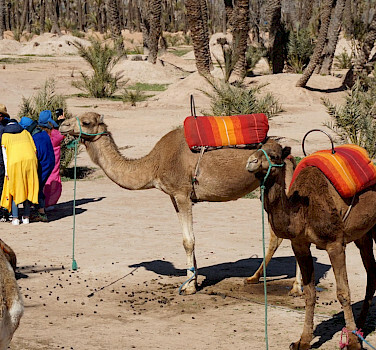 Your destination, Ouarzazate, was a melting pot for desert camel traders leading back to the spice trade era with Tim Buk Tu, Mali. It is a colorful, vibrant, and modern city. Accommodation in Ouarzazate is at a comfortable hotel with a pool and gardens. 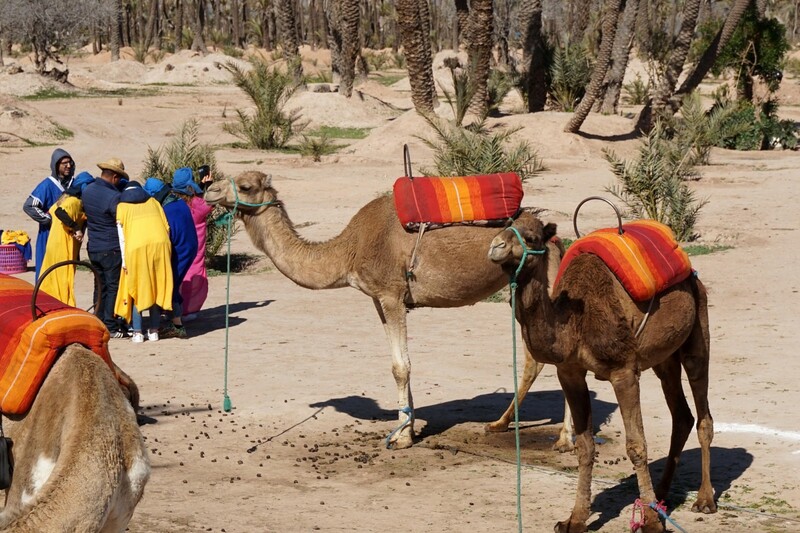 Today offers an optional, half day ride to Fint Oasis, a beautiful desert oasis hamlet tucked into a canyon. This is a day you may choose to rest in Ouarzazate and perhaps explore the souks, Kasbah, and even take a film studio tour. As your last night in Marrakech, there is an opportunity to see the Berber Fantasia show or visit the Dar Es Salam restaurant for a traditional, authentic dinner show.